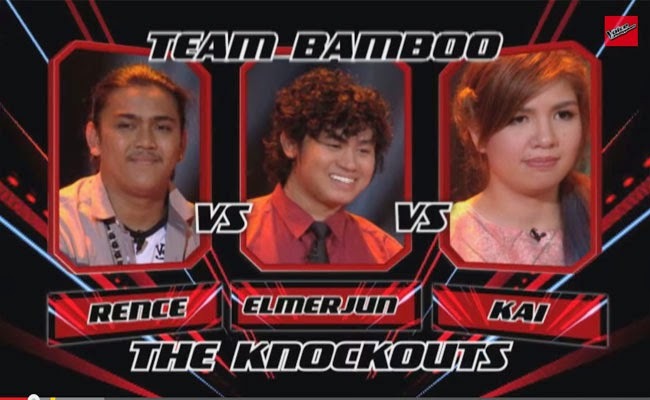 Contenders of Team Bamboo gave their best shot as they went through the Knock Out Rounds on January 18, 1025. The artists had chosen their own song which they felt can showcase their talent best. The second group had been decided by Bamboo. Rence Rapanot performed “Walang Hanggang Paalam” while Kai Honasan gave her best shot with “Limang Dipang Tao” as Elmerjun Hilario tried to own the stage with “Dati”. Rence wanted to challenge himself by singing a patriotic song. He was confused but Bamboo said that emotions had been great help. Elmer chose his song to represent his childhood. Bamboo helped him how to perform the song better in his own style. Kai shows her song to show her theatrical side. She said she was nervous while Bamboo said that she must not show it to the viewers. Bamboo expressed that he felt proud that she had chosen a Tagalog song. Listeners and coaches were put into jive by Kai’s expressive performance, utilizing the whole stage as she sings her song. Rence put the stage in a different mood and connected with the listeners effortlessly. Elmerjun sang the song popularized by Sam Conception while playing with his guitar. Apl said that the song the touched him the most was Elmerjun’s. Lea said the Rence did the best among the three. Sarah said that Elmerjun and Rence had tied in her opinion. Bamboo had chosen Rence and Kai to move on to the Live Shows. Rence Rapanot and Kai Honasan moves on to the live shows together with Joniver Robles and Karlo Mojica as part of the Top Six to represent Team Bamboo and try to catch the title of The Voice of the Philippines.